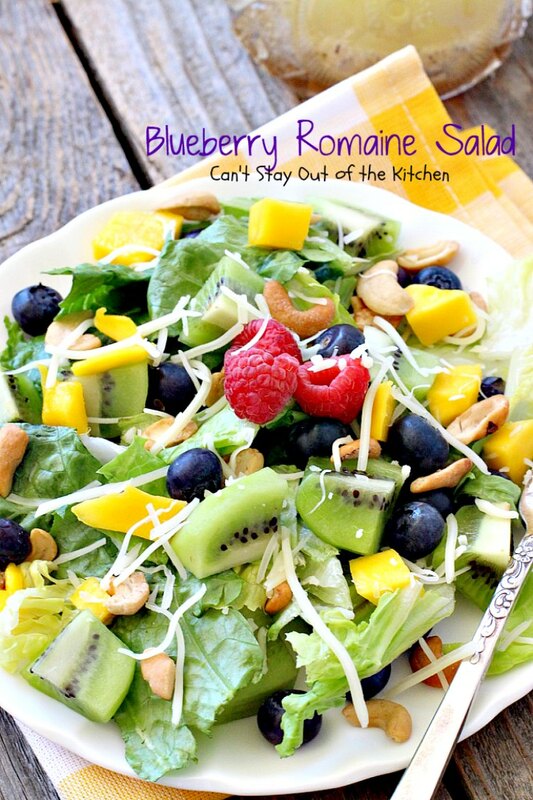 Blueberry Romaine Salad is another one of those dynamite salads I love to eat. 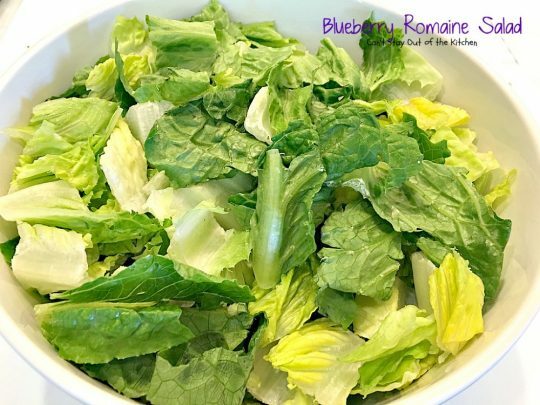 It’s also the perfect salad to serve for Mother’s Day just around the corner. 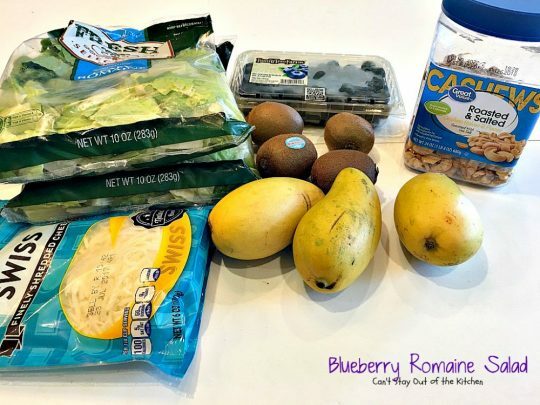 It starts out with some favorite items like romaine lettuce, Swiss cheese and cashews which I’ve used in many other salad recipes. But this one throws you a curve by adding blueberries, kiwis, and one of my favorite fruits: ataulfo mangos. It is oh, so spectacular. Yes, I love ataulfo or champagne mangos and could eat them daily. When they’re ripe they’re sweet and delicious and perfect in salsa with chicken, salads, muffins, or cookies. And, of course if you’ve never tried dried mango it is outrageously good and terrific for snacks. I prefer to eat them plain, but every now and then I cut them up into salads and other interesting recipes. This lovely salad reminds me of Florida. The bright yellow mangos are like the sunshiny days we grew up with. Last week my husband and I were down in Miami Beach for a conference. We took a day and drove out to Key West. The water was absolutely gorgeous–like a jade green color that was utterly the most beautiful I’ve ever seen. Islamarada was our favorite place. Key West was filled with mopeds, bikes and cars parked on both sides of the streets so that it was a little hard to navigate. We did drive out to the pier and got several shots of the gulf. Yes, the water was indescribable unless you’ve been to the Bahamas or Bermuda. It is a long, long, long drive out there from south Florida. I had not been out to Key West since I was a very young girl in 1960. We had just recently moved to Florida from Seattle and my parents wanted to tour the state during Christmas vacation. We stopped at a hotel in Key West with a pool (a novelty for all but the rich in those days). My younger brothers and I were all hanging onto the railing and somehow I got knocked into the water. I couldn’t swim. I bobbed up and down several times before my dad saw me and swooped across the pool and saved me. Those are my memories of Key West! I’m sure the keys are a lot more populated now than they were then. Sure, it’s a tourist trap, but oh, the water was so lovely. I couldn’t get over how breathtaking it was. It’s so much prettier there than either of the coasts in the central part of the state where we lived for years. 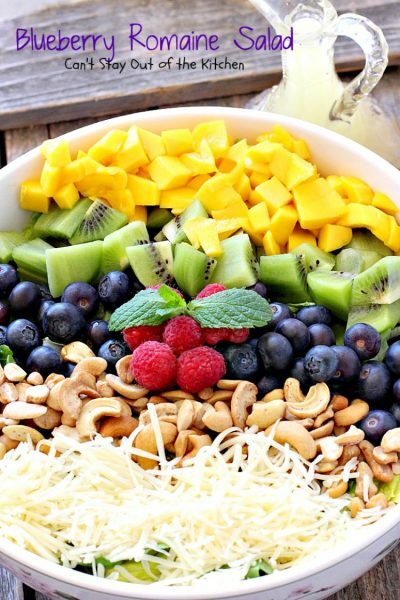 Okay, back to this lovely salad. I whipped up a batch last month and served it along with a new dish, Chicken with Mushrooms, Tomatoes and Artichokes. Both were superb. They were also healthy, gluten free and clean eating. 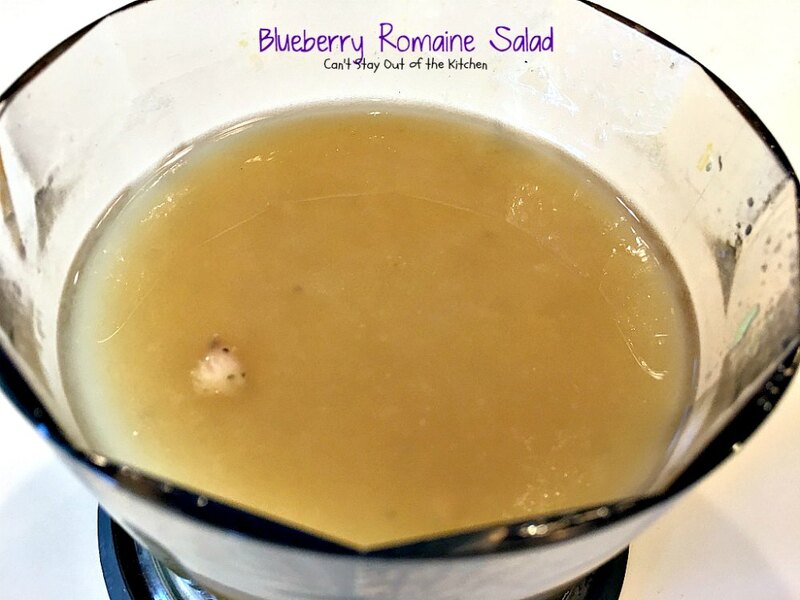 The dressing is simple and can be whipped up in about 5 minutes. I like to puree it a little in the blender so the flavors emulsify. Most of the time I use the chopper option on my immersion blender because it’s so easy. Blueberry Romaine Salad is a delightful salad your family will love. 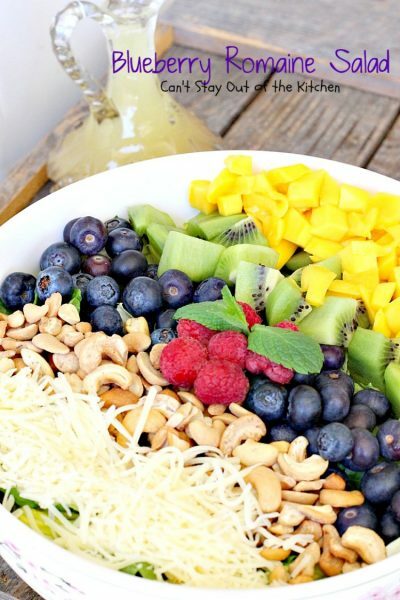 Kiwis, blueberries and mangos are terrific on this salad. The Swiss cheese and cashews counter-balance the sweetness of the fruit providing scrumptious taste and crunch. This makes a terrific company salad. I used these ingredients. I think I actually ended up using six kiwis to have enough because these were small. Place romaine lettuce in a large salad bowl. 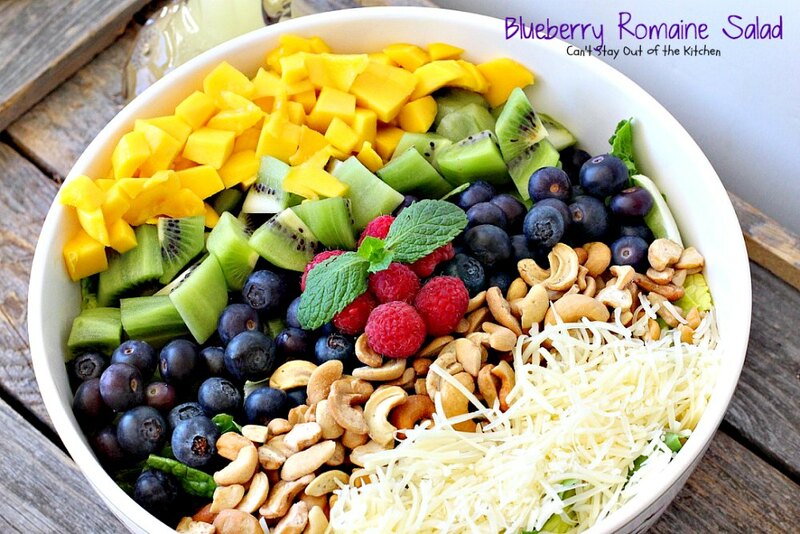 Add chopped mangos, kiwis, blueberries, cashews and Swiss cheese. Refrigerate until ready to serve. I used these ingredients for the salad dressing. You can also use sugar if you prefer a sweeter dressing. 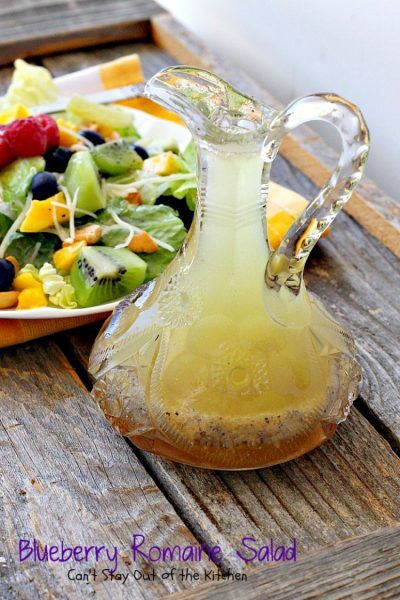 Pour dressing ingredients into a carafe or cruet and set aside until ready to serve the salad. 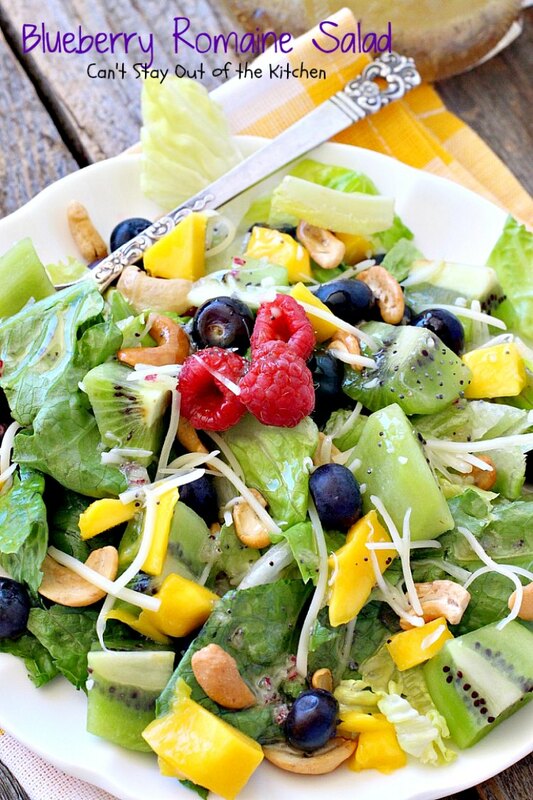 Toss salad with dressing before serving. This delightful salad is perfect for hot summer days when you don’t want to heat up your kitchen. 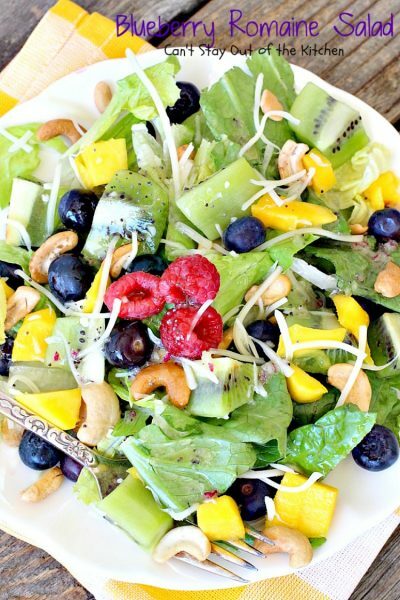 This fabulous salad includes blueberries, kiwis, mangos, cashews and Swiss cheese in a tasty homemade poppyseed dressing. 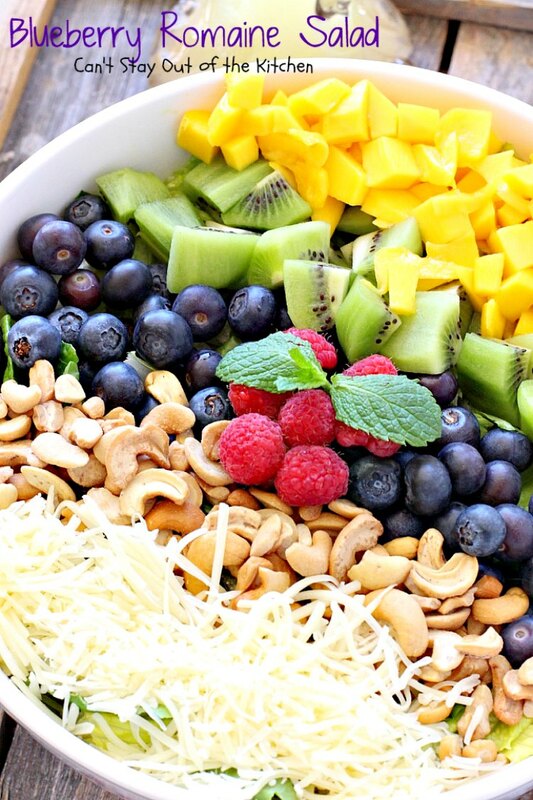 Perfect company salad. Gluten free. Layer salad ingredients in a large salad bowl. 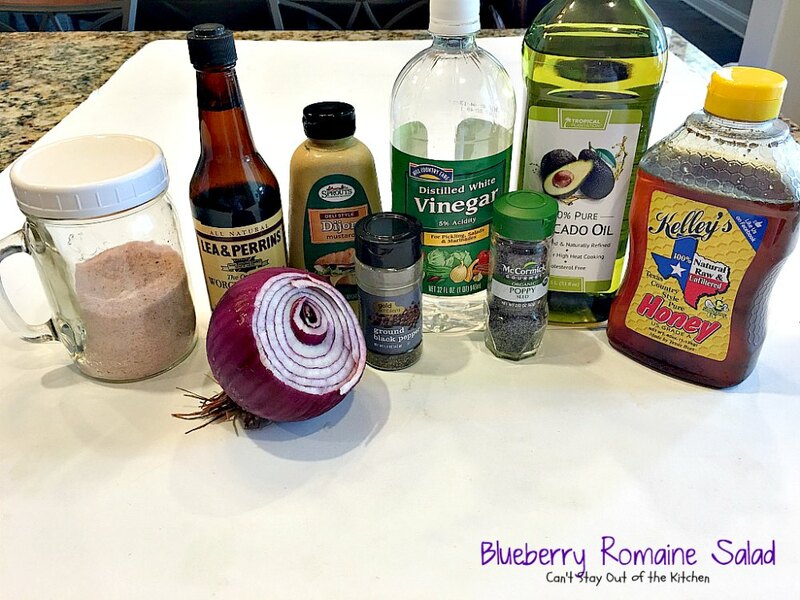 Process salad dressing ingredients in a blender until emulsified. NOTE: I use the chopper option on my emulsion blender to process the salad dressing. NOTE: Lea & Perrins makes a Worcestershire sauce that's gluten free. Blueberry Romaine Salad is one of our favorites! If you enjoy tropical fruits like mangos or kiwis, you’ll love this salad.